The Hiltibidals have simply accepted the call of God upon their lives, which is to take the Gospel of our Lord and Saviour Jesus Christ to the people of Romania. They are simply going so that the lost can know of the Saviour's great love where with He loved the whole world. The love that He showed by giving His own life on the cross so as to provide mankind with true and lasting salvation. They are going, not just because God has called them too, but because God has placed a desire in their hearts. This desire is to share the truth concerning Jesus Christ, the One who is the Lamb of God which came to take away all of our sins, with the Romanian people. The Hollands were both saved at a young age and were raised by godly parents who kept them in church from the time they were very young. Over the next several years of their lives the Lord graciously called them to serve Him in full time ministry. The Lord led them to educate themselves in the knowledge of His Word at Massillon Baptist College in Massillon, Ohio. There they were able to attain valuable material and education that will be invaluable in their efforts on the foreign field. Shortly after graduating from Bible college they were married, and the Lord granted them the privilege of working in the ministries of Gateway Baptist Church in Sundance, Wyoming. While there they gained wonderful experience in the realms of preaching, teaching, song leading, directing the choir, teaching junior church, and other invaluable experience in a local church setting. They are very excited about continuing in the path the Lord has set for them in serving Him on the mission field of Norway. They are very grateful for faithful Christians who will pray for and support us in this ministry. For over a decade the Oana's have served and preached the gospel to the gypsies in Romania. By His grace they have planted 13 churches in Bihor area and trained 13 nationals and ordained them as pastors. Their prayers and hope are to expand this ministry in other villages and towns where the gospel of the Savior has not been preached yet! "Yea, so have I strived to preach the gospel, not where Christ was named, lest I should build upon another man's foundation." - Romans 15:20. Let's pray for this faithful family! Bro. John Weldon is a church planting missionary and he also runs the Anchor of Hope. The Anchor of Hope is an orphan and Family foundation started by missionary Paul Hamilton. The ministry of orphans was began in 1998 in a Orphanage in Prednistrovia, Moldova. There were 786 orphans in the state orphanage in the village of Glinnoe. Many of these children were without the basic necessities of life, many didn’t even have shoes. At that time God burdened Brother Paul’s heart and the lord opened the door for him to work with the fatherless. Because of the physical supply that was being provided by God, God was opening the door to preach the word of God weekly. As a result there were many orphans that came to Christ. The ministry there was short lived and a communist director came in and they denied us the opportunity to preach there. Nonetheless, God had alreadybeen working through prayer and he was opening a new door of opportunity in the village of Streseni. In 1999, we started the ministry there and many of these children came to Christ. In 2011, Brother Hamilton turned the ministry of orphans to Brother John Weldon and family. Brother John has organized many Christmas plays and continually has weekly outreaches in the Orphanage. Since Brother John’s arrival the Lord has opened the ministry to 3 new orphanages reaching these fatherless children with the gospel. In May 2016, Skelmersdale Baptist Church in Liverpoool, England, called Bro. Williams as pastor. SBC has seen God open amazing doors for them. The council has given them a building for the cost of $1.75 a year! When they came there was 9 others in attendance, but since then God has grown His church amazingly. They are finishing a building project to expand the auditorium to accommodate over 75 people. they are excited about what God is doing and thrilled to serve these amazing people in the Liverpool area! Pray for them as we continue training nationals to start independent Baptist church across England and the world. Bro. William's life’s verses are Philippians 1:20-21 According to my earnest expectation and my hope, that in nothing I shall be ashamed, but that with all boldness, as always, so now also Christ shall be magnified in my body, whether it be by life, or by death. For to me to live is Christ, and to die is gain. The Yetzer's were both born and raised in Ohio. Bro. 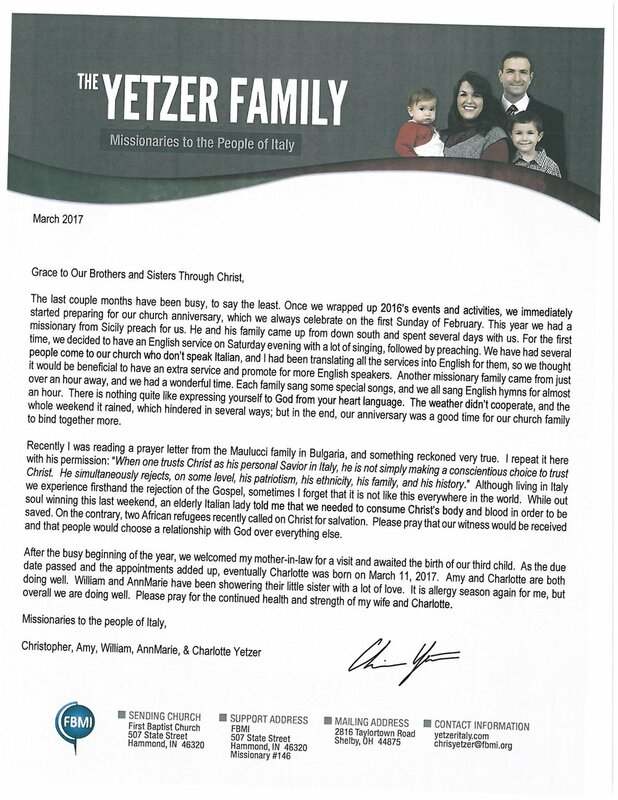 Yetzer was reared in a faithful Catholic family. A confused Catholic youth worker gave the story of Jesus’ grace to him when he was fourteen. That experience gave him a false salvation testimony that he used when he started going to a Baptist church in tenth grade with a friend. That Baptist church was the first place Bro. Chris heard truth clearly preached from the King James Bible. The realization that the preaching was true because of God’s Word thrilled him. He moved to Columbus and searched for a church close to where he was staying. There Bro. Chris discovered what standards are and began changing mine. A bus route took over his usual Saturday activities, and he found myself lingering around the church wanting to converse and be with the people of God. Upon deciding he wanted to go to Hyles-Anderson College, Bro. Yetzer received an application in the mail. The application asked him for his testimony of salvation. Conviction gripped him because he knew he was not saved. The next Sunday, on August 3, 2003, he repented of his sin and asked Jesus for His gift of eternal life. The Yetzer's have one son and one daughter. William Allen was born on December 9, 2007, and Ann Marie was born in Italy on September 7, 2011.